Gathering Reflection: Why Do We Gather? A Gathering is like walking a Labyrinth together. 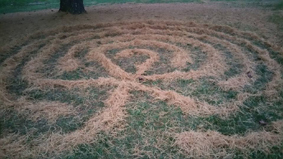 We are welcome as we are, and our involvement with the Labyrinth and the Labyrinth community does not homogenize us or erase our individuality. Rather, it encourages, supports, and celebrates our unique expressions of ourselves! It welcomes our diversity and reveals our shared Center. This is why the Labyrinth is a tool for peace, for healing, and for unity. To support this mission is why we gather. The Gathering featured insightful and inspiring presentations by our three keynote speakers. On Friday evening, Maia Scott opened our eyes with her multifaceted presentation, “Seeing the Journey Ahead with New Eyes: Living Through the Lens of the Labyrinth.” She playfully incited us to Insight as she invited our participation in several experiments, giving us the opportunity to see the labyrinth from multiple perspectives with the fresh eyes and imagination of a visionary. She even showed us how to translate the rhythms of the labyrinth into poetry! The Gathering also gave the attendees the opportunity to choose from and experience a wonderful assortment of workshops, poster presentations, mini -sessions, a panel discussion offering perspectives on using the labyrinth to manage transitions, and many other life-affirming and creative activities, including an active marketplace and our annual TLS silent auction (which funds Gathering scholarships). We concluded with a beautifully inspiring Closing Ceremony lead by Ellen Bintz-Meuch, including a group Global Healing Response labyrinth walk. After the official ending of the Gathering, David Nickel hosted a local Art Studio tour on Sunday afternoon, and John Ridder and Dhyana Raynor led an all-day Labyrinth Tour Monday morning. We are grateful to everyone who worked tirelessly to organize the amazing Waycross Gathering, including local Gathering host, John Ridder, TLS Gathering Liaison, Stephen Shibley, and the numerous TLS volunteers who graciously contributed their time and energy. 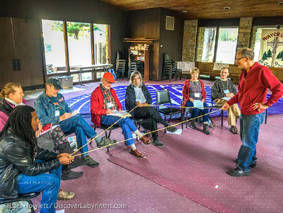 May the positive energy of the 2015 Gathering live on and flow to our next highly-anticipated 2016 TLS Gathering in Houston, Texas, with the theme “Diverse Journeys on a Common Path.” See you there! 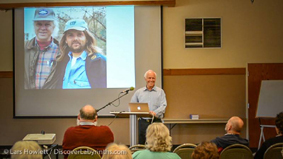 I had the pleasure of taking both pre-Gathering workshops at this year’s Gathering in Indiana. I am not a fine artist and usually avoid art workshops, even at labyrinth events, but taking Lisa Moriarty’s and Carol Maurer’s classes was too good an opportunity to pass up. Both are creative and dedicated labyrinth artists, with years of experience, so I knew I was in good hands. They are also both excellent teachers, encouraging and guiding participants every step of the way. 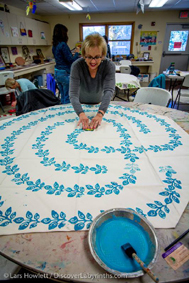 Lisa’s workshop, Creating Personal Prayer Labyrinths, was a lesson in patience for me. Lisa supplied pre-cut, blank canvases that allowed enough room for a 3- circuit design, as well as a selection of patterns to choose from, and all 18 of us hunkered down to help each other pencil in the pattern on the canvases. Working as a team, we swiftly got the canvas patterns done which left plenty of time to add our own unique touches with paints, brushes, stamps and stencils. Lisa supplied all the materials and, while a few seasoned artists painted free-style on their canvases, many, like myself, used the stamps and stencils. The results were uniformly an interesting mix and a delight to behold. Despite often using too much paint with the stamps and dragging my shirt through the paint on the edges (this is where the patience came in), I was still pleased with my celestial labyrinth and enjoyed the class very much. 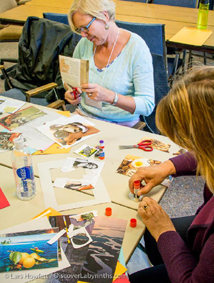 Carol Maurer’s workshop, SoulCollage with Carol Maurer, was similar to Lisa’s in that the participants were invited to create their own SoulCollage card from materials that Carol supplied. Though I’d heard about SoulCollage many years ago, I was drawn to Carol’s workshop which combined the traditional SoulCollage steps with walking a labyrinth. Carol placed small tables over the labryses on and next to the corners of the Petite Chartres style labyrinth in one area of the room. On the tables were torn out magazine pictures of various subjects that we could use to create our cards. Carol encouraged us to meditate on one thing in our lives that had meaning for us, enter the labyrinth and then stop and pick up a picture or two then move on. If we had extra materials we could keep them and make more cards on our own. It was a wonderfully clarifying exercise for me. I had no idea what I was going to do and yet what occurred was a picture, with many overlapping pictures, of what was important to me in my life and what I needed to empower. And again, when we laid all the cards out on the labyrinth for everyone to see, the wide variety and creativity of the cards was lovely and so fun to share. Another workshop that I attended, Discovering the Genesis Point, with the Rev. Dr. Calen Rayne and Laura Esculcas was one of the most enlightening workshops I’ve taken anywhere at any event in the past twenty years or so. Dr. Rayne is a true mystic healer and is probably so used to operating multi-dimensionally that he comes across as a bit taciturn and distracted in this one. 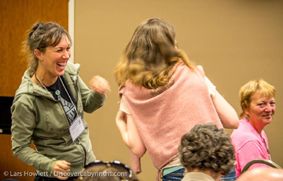 Laura, with her gracious, grounded delivery style, is a perfect foil for Dr. Rayne’s personality and often brought the workshop discussion back to the practical how, what, where and why’s of the Genesis Point process. I am a dowser and know dowsing basics, but Dr. Rayne took dowsing to a whole new level as he showed us how to establish the Genesis Point; where earth energy comes into a room, then where the entrance point for this energy is on the labyrinth in the room, and what, if any, obstacles or negative blocks exist on the labyrinth that need clearing. WOW! Dr. Rayne used a single dowsing rod to find these and showed us how to do it too. His method of clearing the stuck energy was simply to ring Tibetan chimes or a singing bowl or sweep a sacred object or picture of a sacred place or object, over the area and the stuck energy dispersed. Then, using John Michael Greer’s Sacred Geometry Oracle deck, Dr. Rayne asked the labyrinth what it wanted to do that day for this particular group. He dowsed and counted the number of times the rod swung completely around in a circle. He then counted to that card number in the deck and laid the chosen card face down on the labyrinth. He did this procedure six times. Then he went around turning over the cards and reading the divinations aloud. The results were insightful, creating a cohesive plan of action for the group to follow, which was amazing to many of us. This process can be done outside as well as inside and Dr. Rayne has used it to re-awaken dormant energy points, vortices and leys around the world. I’ve touched on just the surface of the information conveyed during this workshop and I believe it deserves to be a full keynote address at a TLS Gathering in the future. Everyone who works with labyrinths should know about this method because increasing the transformative potential of labyrinths is one powerful way we can all help to heal our precious planet. Laura and Dr. Rayne make this rather esoteric process easy to understand and use for neophytes as well as seasoned energy workers. The Panel Discussion, The Circle of Life: Using Labyrinths to Navigate Transitions. In my experience, panel discussions work best when the panelists come from a variety of backgrounds so that a lively discussion ensues, bringing out the best of both or many viewpoints. This panel all shared similar, positive philosophies on the beneficial results from using labyrinths in all types of transitional situations. Everyone was very enthusiastic and agreed with each other, but nothing new or controversial was discussed or uncovered so, for me, it could have been more engaging. But perhaps, for those just coming to the labyrinth world, the material might have been reassuring and informative. Certainly all the panelists knew the material and were well spoken. I think the panel idea is a good one and, perhaps in a different context, might work well for future Gatherings. The post Gathering Art Tour was a scenic trip through beautiful Brown County to the T.C. Steele studio, gallery, and home. Steele was an impressionist artist who was well known nationally for his Indiana landscapes. We had a tour with a docent through the spacious studio/gallery, which was filled with light, and learned about the lives of this man and his family. Afterward, we were treated to a tour of his rambling home, with a wraparound porch, which offered scenic views of the gardens and valley below. The home has been preserved in its original condition, including the furniture and a large stuffed peacock, which fascinated the neighbors in his day. The next stop was Nashville, which is a charming Southern Indiana shopping mecca and artist haven. We had a couple of hours to browse the galleries and shops, which had products ranging from the most sophisticated art and whimsical crafts to typical tourist bait. We had a great time and came back with everything from pumpkin fudge to pottery. Beth shared background information about the origins of Celestial Labyrinths and the originator, Adrian P. Kezele (Patrick Adrian) and his book Labyrinths and their Secrets. In this session, Beth also shared the seed patterns of the celestial labyrinths, their symbolism, and how to draw/build them. Beth also discussed her experience of the visiting the City of Celestial Labyrinths in Croatia where the nine celestial labyrinths have been newly constructed in a park. I think her personal experience with the labyrinths in Croatia enhanced the session as she clearly explained the various labyrinths and their celestial meanings. Session attendees had the opportunity to draw the various seed patterns and then were encouraged to go out and create them on the Waycross grounds. I was personally drawn to the Labyrinth of the Moon. I did not know what to expect. I was in rural Indiana and I was wondering how many labyrinths we would visit. How many labyrinths are there is rural Indiana? I know John Ridder, a Labyrinth Master who lives in this community, so I felt confident that it would be worth my time. And it was! I loved every minute of my time adventuring local labyrinths. 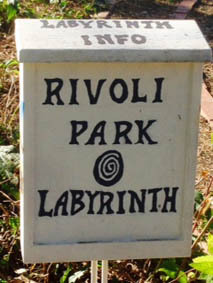 My favorite labyrinth was the Rivoli Park Labyrinth. Not because it was the largest or that is was made of fine materials like granite; what I enjoyed most was the story behind this labyrinth. 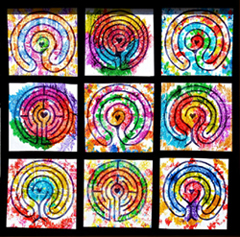 Lisa Boyles had a vacant piece of land and she created a 42' Triune circuit design labyrinth. Bricks line the pathways and plants enhance the outdoor nature of this labyrinth. She built this labyrinth for herself and for her urban community to enjoy for many, many years to come. Lisa saw a need for a contemplative space in the middle of her urban neighborhood, and she and other volunteers built it. She dreamed it, they built it, and they come to walk it. Perfect! Thank you, Lisa, for who you are and for the labyrinth that you created. And for dreaming this labyrinth into fruition. I am looking forward to your next creation. You are amazing! A large group of us gathered to learn about setting intentions using Despachos, or prayer packets. Deborah began her session by sharing with us about setting intentions, especially if we had something on our hearts that was concerning to us. She explained that the Andeans placed significant objects in their prayer packets and burned them in as a symbolizing their prayers to rising. This was followed by a very meaningful guided meditation after which we went into an adjacent room with an abundance of supplies to begin making our own prayer packets. We selected our supplies from beautifully designed papers to make the packet – similar to a package or envelop. We added items inside that had meaning to us such as various herbs, shells, feathers, etc. We could place a seal of wax on the outside if we desired. We all decided they were too beautiful to burn. Jodi introduced the session and after a brief mediation, instructed us to select images and words from magazines to make a collage that symbolized our hopes and dreams. She had a variety of magazines and supplies. We were also given a plastic notebook sheet and we each selected a labyrinth design and traced the pattern on the clear plastic sheet. We inserted our finished collage inside, then traced the labyrinth pattern with puffy paint. As we traced the path of our labyrinth, we set our intentions as our fingers were moving over the images that represented our desires. The session was well attended and Jodi was well prepared! each meeting of the eyes. pay the bills, park between the lines. as the path lures you. of your wisdom, breathe in the betrayals and the chains. refined by the furnace of their hopes. stand at the center of the world. for your wonder and your wandering. that sets your heart on fire. Those who are acquainted with Tom Vetter know that behind the constant geyser of ingenuity, invention, and geo-topological morphery lurks an imp of Daedalian proportions, a punster sans-pareil, a Trickster of the first order. 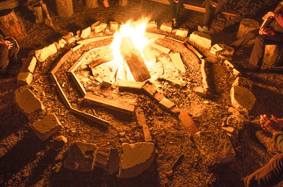 Earlier this year, your fearless editor invited Tom to instigate and host an informal Gathering Campfire Limerick and S'Mores session, and capture what he could (remember...). [Tom "Daedalus" Vetter and the righteous string. We may never know what actually transpired (what happens round the campfire, stays round the campfire), but we do know (1) Tom has a theory of labyrinthine humor, to be explored over the coming year, and (2) limericks (and verse) were produced round that bonfire. Here is a printable one, submitted by Anne Gordon. Whose image went straight to the heart.